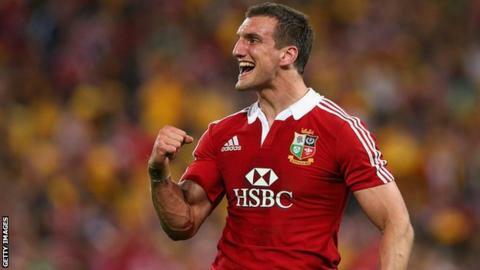 Captain Sam Warburton says heavy Wales involvement in the 2013 British and Irish Lions success over Australia will be irrelevant in Cardiff on Saturday. Cardiff Blues open-side Warburton led the Lions down under, but Wales have lost eight successive Tests against the Wallabies. "The Lions has no bearing on the match on Saturday," said Warburton. "It is for Wales, and the Welsh fans will want to see it as well as the players." There were 11 Welshmen in the Lions' side in the Sydney Test starting line-up, with Ospreys lock Alun Wyn Jones taking over as captain from Warburton before two more Welshmen also came on as replacements. And with Wales in the same 2015 World Cup group as Australia and England, Warburton believes there is added significance to the forthcoming Millennium Stadium clash. "The Lions hasn't been spoken about once. I haven't been thinking about it," said 25-year-old Warburton. "There might be nine or 10 of us who played against them, but there are still another 13 guys in the [match-day] squad on Saturday. Wales have lost their last 13 Tests against South Africa, including seven under Warren Gatland. Wales's win in 1999 was their only one in 27 meetings. Wales have beaten New Zealand three times in 29 meetings - but not since 1953. They have lost the last 25, including six under Gatland. "The players are very confident and if we can finish this series [of matches] with three wins out of four then it would be a success compared to last year." Wales began the 2012-13 season with four home Test autumn defeats before going on to successfully defend their Six Nations title and Warburton believes beating a major southern hemisphere side would boost their chances of success in the 2015 World Cup. "I have always thought that Wales can't be called contenders, until we beat the southern hemisphere sides," said Warburton, who has won 40 caps for his country. "There is still another campaign next autumn, so it's not like someone is holding a gun to your head saying 'you have to win this weekend'. "But sooner, rather than later, it would be nice because it gives you momentum going into the Six Nations. "To beat Australia would be a big hurdle for Wales and we have got to try to achieve that this weekend. It would be massive to get a win. "If we could finish the year with a win then it would be one of the most successful years Wales will have had in a while - that's a big motivating factor for me." While Warburton says he does not expect an easy game up front against the Wallabies, he added that he would be "annoyed" if any of his players viewed themselves as underdogs. "On television it might look easier up front against Australia, but it doesn't feel like that as a player," said Warburton. "They are very good at the breakdown, and I have always found it a very physical, tough battle up front and I would expect the same on Saturday. Australia and Warburton was impressed with the Wallabies' performance. He said: "I thought they were great against Ireland, it was a good scoreboard for them. "Playing against Australia are some of the most difficult games because the ball is in play quite a while, and you can have periods when you end up defending quite a lot. "They are tough matches to play in, but they have always been exciting matches and they always seem to be entertaining games."